Tigger is worried about his new friend! : Click to see the rest of the story! Tigger Travels - Family Adventure Journal Photos From Tigger`s Travels and MORE! 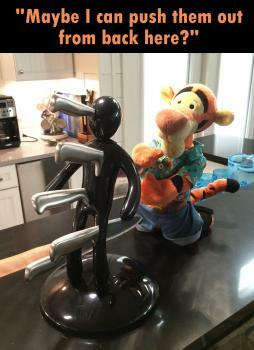 Tigger is a little worried about his new friend! "Can I pull those out for you?" "Maybe I can push them out from back here?" "How about just a kiss on the head to make it feel better." 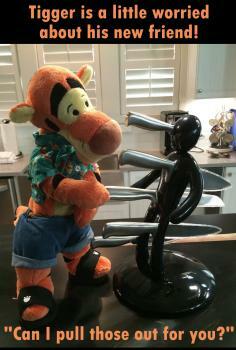 Tigger is worried about his new friend! Click to see the rest of the story! Tigger makes friends where ever he goes... this new friend really made him worry, though! This knife holder at the Buena Vista unit in Pirate's Bay, Port Aransas, Texas fits in to the HUMOR that shows all over Mustang Island. This place is a wonderful place to stay in luxury for groups or families up to nine guests and plenty of parking! Check out this great property for YOUR next vacation rental! Buena Vista, Port Aransas, Texas. 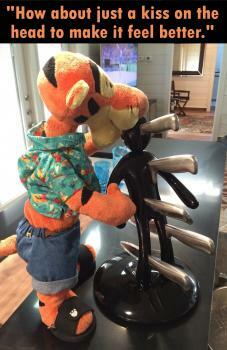 Tigger's new friend...? Check out this great property for YOUR next vacation rental!